The Surface Go that is reviewed for this article is the one that has 8GB RAM, a 128GB SSD, an Intel Pentium processor, and an LTE modem. It’s sold for $679, but you can find deals for at least $50 less. Microsoft has made quite a name for themselves with their Surface Line. The Surface Pro has, perhaps, become the most innovative computing device of the past decade. Microsoft failed with the basic Surface line, which was just too slow and underpowered to be used for anything. 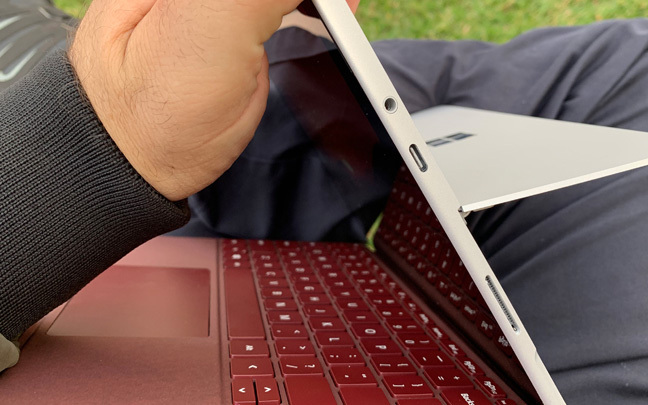 The new Surface Go, unlike the Surface Pro 6, has a USB-C connector. The screen is actually quite decent. It doesn’t have the same pixel-per-inch density as the Surface Pro (267 PPI vs 217 PPI), but it’s not a cheap screen. It is bright, viewable from sharp angles, displays accurate colors, and has a very good contrast ratio. The battery life doesn’t seem great. From minor use, I predict I can get, at most, 5 or 6 hours without having to recharge. More specific tests need to be performed. At least the Go has a USB-C connector. This means I don’t have to lug around Microsoft’s own charger wherever I go. The Surface Go is slow compared to the Surface Pro 6, but it’s supposed to be. Don’t think of the Surface Go as a laptop replacement; it’s more like a laptop companion. The Surface Go is fine for 75 percent of the tasks I usually do. I can even use Photoshop, but it’s really slow. The bezels take up too much space around the 10-inch screen. But this is actually good for being able to hold the tablet and not worry about touching the screen. Despite the bezels, one can tell that Microsoft put a lot of thought into designing this. The Type Cover, with smaller keys, is hard to get used to at first. But after a few hours, I really like it. The cover works just as well as the one on the regular Surface Pro works. Surface Pen input is okay, but not great. Unlike the Surface Pro 6, there is pen jitter and a little latency. It’s great for taking notes. The speakers produce wide sound for such a small device, but nowhere in the league of the speakers on Apple’s tablets. Honestly, even though the Surface Go has its faults, it’s hard to put down. I’ll let you know if that’s the case after a couple of days when I post my full review. 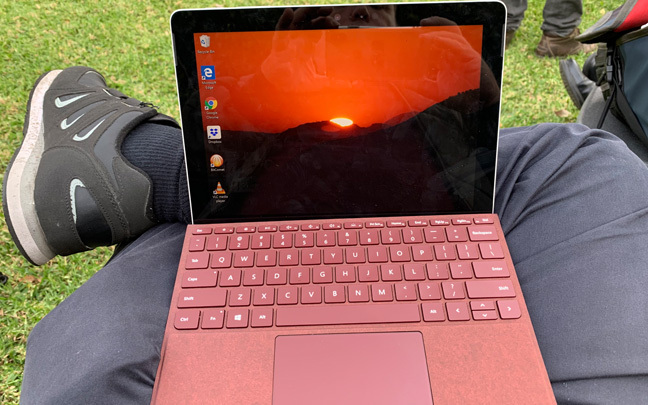 This entry was posted in Review and tagged Microsoft Surface Go, Surface Go, Surface Pro. Bookmark the permalink.